All Indie Magazine: Inside & Out with Liz Seaver: Interview and Music Preview of "Final Alter"
Inside & Out with Liz Seaver: Interview and Music Preview of "Final Alter"
Liz Seaver is a young Pop Folk singer/songwriter from Skerries of Dublin, Ireland. The big news in 2010 was when Liz nearly became the €10,000 winner of the YouBloom contest. While she didn’t win the grand prize, she placed respectively with a top 5 finish amongst thousands of competing artists and bands. 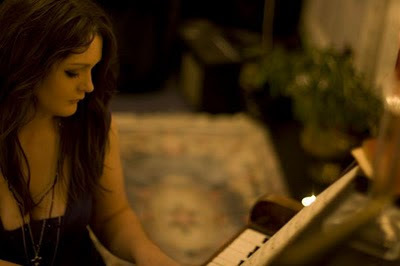 Having grown up around music since the age of three, Liz was destined to be involved with music of some sort. At the age of 15, she released her first CD, “Till the Day Fades” and she worked for an art college and taught piano and guitar lessons and eventually graduated with a degree in Fine Arts. Typically, I can pinpoint who an artist compares to, but with Liz, I had a hard time finding a match. That is the beauty Liz Seaver. It is her uniqueness. While she may fit within the folk pop genre, her subtle music and angelic vocal style make her stand out as her own brand. Together with original lyrics and staying clear of mundane phrases that are common in most music. Instead, you are pulled into each and every story within the song, especially in the songs, “Inside Out”, “I Knew”, and “The One”. During our live interview, Liz and I discuss her newest project and sample four tracks from her new CD called, “Final Alter”, which is currently being recorded and set for release prior to spring 2011. Pretty cool, I like the bands that she has played with. I want to shoot a video like this. Nate, would you like do video interview's with Liz and other artists? You can be an All Indie TV contributor.